Each Aegis Living community’s Snoezelen room takes on its own design and feel, as does the entire center. When a senior is feeling overwhelmed or anxious, whether its due to sundowning or another issue, they can spend some time in the Life’s Haven room to calm their nerves and find tranquility. Every single detail is taken into account to give the resident a chance to clear their minds of bad thoughts and enjoy a truly relaxing experience. The room is kept at a cool temperature around 68 degrees Fahrenheit, the lights are comfortably dim and the gentle colors encourage a sense of ease. These innovative techniques have been proven by the medical world to instill a sense of comfort and serenity while helping residents breathe new life into old memories. Stepping into the Life’s Haven space is like entering your own private garden where you can take a seat on a charming bench while reflecting on the events of the day. It’s an effective non-medicinal approach to soothe agitated or pre-agitated residents to a place of calm. At Aegis on Madison, located in Seattle, the Life’s Haven space reflects the elements of nature to enhance the calming effect. The walls are painted with the warming images of delicate birds, leaves, fruits dangling from branches and delightful white flowers coming into bloom. Meanwhile, calming music produces tender music marked by the mellow, pretty sounds of harp strings, and light aromas stimulate the senses in an amiable, subtle way. Westward in Redmond, Washington, Aegis at Marymoor has recently installed a brand new Life’s Haven room. This engaging space is designed to resemble the quaint porch of a cabin. Features such as pine cones, a fishing net, a paddle, barrels and a gently lit lantern add to the soothing, multi-sensory effect of the Snoezelen room. A guitar (for auditory stimulation) rests against the wall, which is painted to depict a delightful outdoor scenery filled with fruit trees and other lush greenery. There’s also a chess game laid out for seniors to play and interact with each other in a little friendly competition. The Snoezelen room is not a new concept. It was developed in the late 1970s by a pair of Dutch therapists, Ad Verheul and Jan Hulsegge, during their time working at Holland’s De Hartenberg Institute, a center for people suffering from intellectual disabilities. Their goal was to provide a safe, non-threatening environment for people with disabilities that enhance therapy, learning and relaxation. At an annual fair that summer, the duo erected an experimental space aimed at providing a controlled multi-sensory environment that utilized light, texture, aroma, music and color. Features included simple effects such as a blowing fan, calming images projected onto a screen, scented bottles and soaps, musical instruments and tactile objects. It proved to be a huge success, and the pair of therapists went on to develop and perfect the design. They named the multi-sensory experience “Snoezelen” – a combination of the Dutch words “doezelen” (to relax) and “snuffelen” (to seek out or explore). While the Snoezelen room was used only in Europe for nearly two decades, it grew into a global movement in the 1990s. There are thousands of these spaces in more than 30 countries, reaching the U.S. in 1992 with the installation of a Snoezelen in New York City. The momentum continues to grow as people begin to understand the positive responses brought upon by these multi-sensory spaces among people with dementia and other cognitive disorders. 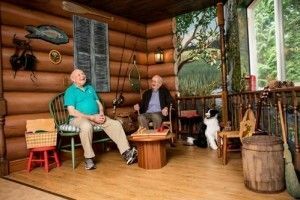 Not all assisted living centers utilize the Snoezelen concept, but Aegis Living, with its dedication to improve quality of life for seniors with Alzheimer’s, takes every step possible to make residents feel at ease and at home. This is just one of the many ways that Aegis centers make every day more enjoyable for residents through Life’s Neighborhood. Combined with Life’s Haven, the program improves life quality through aromatherapy techniques that relax the body, memory boxes stationed outside apartments that let residents share photos and other mementos with each other and Life Skills stations located throughout the center that allow seniors to engage in work, hobbies and other activities.